We have our winners! 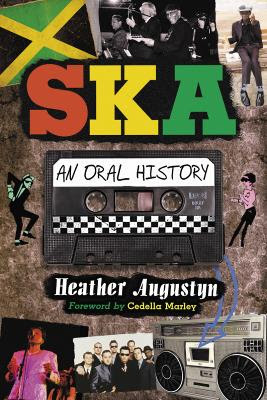 I'm happy to announce that Vicki from Lancashire in the U.K. has won a FREE copy of Heather Augustyn's book Ska: An Oral History and Jerry from California in the U.S. has won a copy of the Bigger Thomas CD 'Steal My Sound' (read the Duff Guide To Ska review). This is the first of several giveaways this month so keep your eyes open for the next competition. Augustyn's 'Ska: An Oral History' is a collection of personal stories and oral histories of over 30 different Jamaican, English, and American ska musicians including never-before heard words from such greats as The Skatalites’ Doreen Shaffer, Roland Alphonso, Lloyd Brevett, Lloyd Knibb, and Lester Sterling; Derrick Morgan and Patsy (Millicent Todd); Lyn Taitt; Laurel Aitken; Toots Hibbert; Millie Small; Alex Hughes (Judge Dread); The Specials’ Roddy Byers (Roddy Radiation); The Beat’s Dave Wakeling and Ranking Roger; Lee "Kix" Thompson from Madness; The Selecter’s Pauline Black; and Buster Bloodvessel of Bad Manners. I reviewed a copy of the book back in October (read the review here) and conducted an interview with Augustyn back in May (read the interview here). Need more convincing? Have a look at some of the reviews the book is garnering across the ska and reggae blogosphere including: Trojan Records and The Jamaican Gleaner.